What would you do if one day another you appeared? And what if this other you didn't act like you at all? 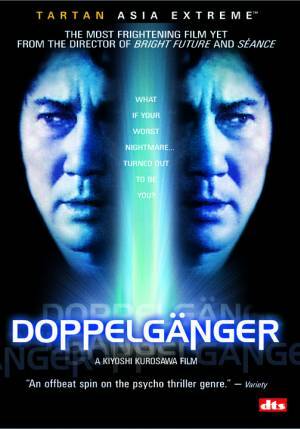 Don't say it couldn't happen, because it did... to Dr. Michio Hayasaki in the supernatural thriller Doppelgänger released by Asia-Extreme. 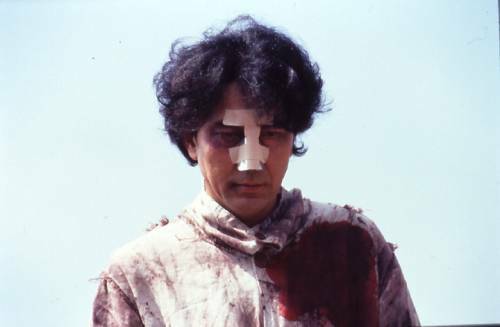 Hayasaki was not just a scientist, but a genius in his field. For his most current project, he was working on creating an artificial body for those in wheelchairs. But development wasn't going well, and the pressure eventually caused the poor guy to split into a completely separate being! Believing that seeing one's doppelgänger would mean certain death in the near future, Hayasaki at first avoids all eye contact with his evil twin while trying repeatedly to convince this familiar stranger to exit his life forever. But that doesn't happen... obviously. In fact, his double starts to take a more active role in the participation of the true Hayasaki's life, doing things Hayasaki would never have had the guts to do. So when Hayasaki's boss walks into the office where Hayasaki and his team were developing the artificial body, and sees it completely trashed with Haysaki's doppelgänger just hanging out, it's no surprise that Hayasaki lost his position at the company. 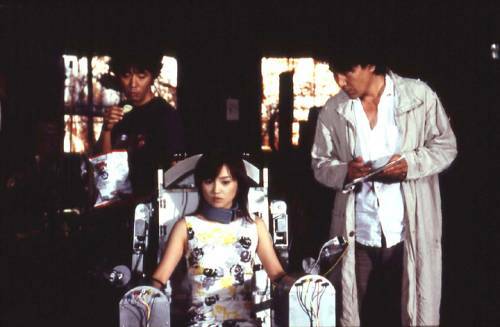 But the situation improves for the real Hayasaki when he is able to continue work on his obsession after his double steals the prototype and hires on an assistant to help out. And thus Hayasaki gradually begins to accept his "brother"...at least for a time. But can one person continue to live as two separate entities, or will this duality catch up with them? And if so, then which one? Will the stress of resuming his project overwhelm him once again? I'm sorry, but I can say no more without giving too much away. I really liked the way this film started out. It showed a woman about to drive home from a store when she spies her brother. She asks if he wants a ride home, but he just waves her off. When she arrives home she hears the TV on, and when she looks in she finds her brother sitting there watching the tube. She shrugs it off, figuring she must have mistaken the guy she saw earlier for her brother. And then the phone rings... and she learns that her brother is dead. What a cool setup for a movie. It's too bad this flavor isn't maintained throughout the whole film. The story next moves on to Hayasaki and his project, which is interesting to see, especially when the doppelgänger is first introduced. Watching Hayasaki with his head down and shaking with fear because he can sense his double coming up right behind him is pretty intense, but things start to go downhill from there, and I'm not just talking about for Hayasaki. On one hand, I liked the fact that this wasn't done like your typical doppelgänger story, where the doppelgänger goes and creates trouble while the true counterpart follows in pursuit attempting to clean up the messes. On the other hand, that would have probably been a lot more interesting to watch than just seeing Hayasaki sit around and work on his project while his other self went out and did whatever he wanted. That's not to say the entire rest of the film is boring, though. Far from it, actually. Things start to really pick up and get interesting again in the third act when events take an unexpected turn. I don't want to give too much away here, but I will say I really like what happened to all the characters through the rest of the movie, which I totally didn't expect. And there is an Indiana Jones' boulder parody sequence that just struck me as hilarious (at least it did at the time, but I was watching it pretty late at night). So although the whole second act of this film is pretty much boring, the first and third acts should hold your interest. Plus, the acting was quite good, especially Yakusha who plays Hayasaki. Often times when he's in a scene with himself, it seems perfectly natural, like it wasn't even a special effect. 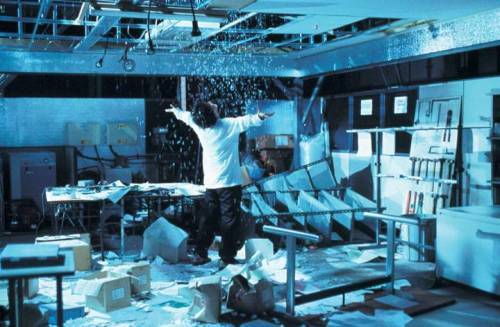 The rest of the effect shots were also pretty good, specifically considering this wasn't a high budget movie. Overall, this really isn't a must-see or must-own movie, but if you have the chance to see it and you're not really doing anything else at that moment, you may want to check it out.